From Facebook to LinkedIn, social media is flat-out rife with phishing attacks. You’ve probably encountered one before… Do fake Oakley sunglasses sales ring a bell? Phishing attacks attempt to steal your most private information, posing major risks to your online safety. It’s more pressing than ever to have a trained eye to spot and avoid even the most cunning phishing attacks on social media. Spammers on social media are masters of their craft and their tactics are demonstrably more effective than their email-based counterparts. Up to 66 percent of spear phishing attacks on social media sites are opened by their targets, according to a report by ZeroFOX. This compares to a roughly 30 percent success rate of spear phishing emails, based on findings by Verizon. 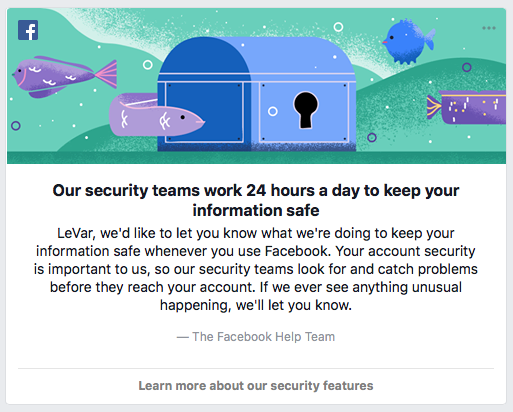 In a whitepaper published last year, Facebook warned of cybercriminals targeting personal accounts in order to steal information that can be used to launch more effective spear phishing attacks. Facebook is taking steps to protect users’ accounts from hostile data collection, including more customizable security and privacy features such as two-factor authentication. The platform has also been more active in encouraging users to adopt these enhanced security features, as seen in the in-app message below. The rise of social media has changed the way customers seek support from brands, with many people turning to Twitter or Facebook over traditional customer support channels. Scammers are taking advantage of this by impersonating the support accounts of major brands such as Amazon, PayPal, and Samsung. This tactic, dubbed ‘angler phishing’ for its deepened deception, is rather prevalent. A 2016 study by Proofpoint found that 19% of social media accounts appearing to represent top brands were fake. To avoid angler phishing, watch out for slight misspellings or variations in account handles. For example, the Twitter handle @Amazon_Help might be used to impersonate the real support account @AmazonHelp. Also, the blue checkmark badges next to account names on Twitter, Facebook, and Instagram let you know those accounts are verified as being authentic. Trending content such as Facebook Live streams are often plagued with spammy comments from accounts that are typically part of an intricate botnet. These spam comments contain URLs that link to phishing sites that try to trick you into entering your personal information, such as a username and password to an online account. It is best to avoid clicking any links on social media from accounts you are unfamiliar with or otherwise can’t trust. You can also take advantage of security software features such as real-time anti-phishing to automatically block fake sites if you accidently visit them. Yes, phishing happens within Direct Messages, too. This is often seen from the accounts of friends or family that might be compromised. Hacked social media accounts can be used to send phishing links through direct messages, gaming trust and familiarity to fool you. These phishing attacks trick you into visiting malicious websites or downloading file attachments. For example, a friend’s Twitter account that has been compromised might send you a direct message with a fake link to connect with them on LinkedIn. 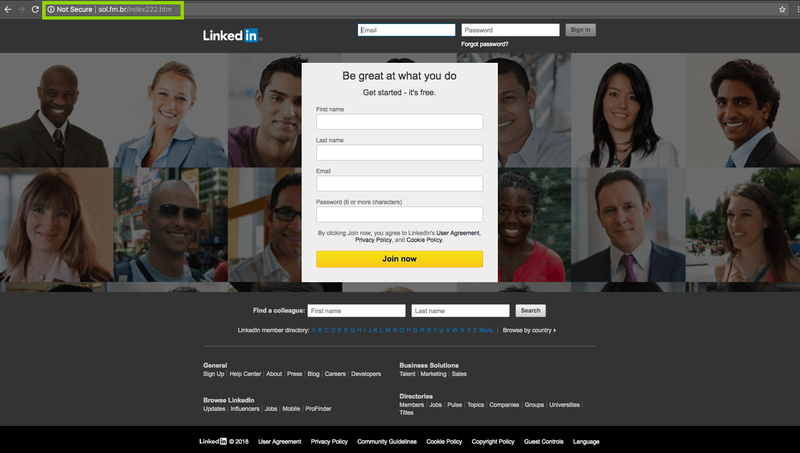 This link could direct to a phishing site like the one below in order to trick you into giving up your LinkedIn login. While this site may appear to look like the real LinkedIn sign-on page, the site URL in the browser address bar reveals it is indeed a fake phishing site. Fraudsters are also known to impersonate brands on social media in order to advertise nonexistent promotions. Oftentimes, these phishing attacks will coerce victims into giving up their private information in order to redeem some type of discount or enter a contest. Know the common signs of these scams such as low follower counts, poor grammar and spelling, or a form asking you to give up personal information or make a purchase. The best way to make sure you are interacting with a brand’s official page on social media is to navigate to their social pages directly from the company’s website. This way you can verify the account is legitimate and you can follow the page from there. The post Just Keep Swimming: How to Avoid Phishing on Social Media appeared first on Webroot Threat Blog.